My website was created using Joomla!, which has a very blog-like user interface. I find it easy to update my site because Joomla! stores content in ways that make sense to me. Rather than creating individual pages that remain static and must be changed individually, Joomla! creates pages on the fly by pulling the blocks of information you tell it to. A block of information could be an article, a document for download, a menu, a photograph, etc. The other great thing about Joomla! is that it is free. Richard did the set-up but, by and large, I keep it maintained. Since Joomla! is an open source program, there are a lot of add-ons available. This means we can choose from several types of photo galleries, search functions, etc. I spent several hours yesterday and today updating my website. I didn’t do any major overhauls, but I added new pictures to the galleries, updated the information on my appearances page, and added some new teaching materials in the photography section. Please let me know what you think. Also, if there is content you’d like to see that’s missing, please let me know. 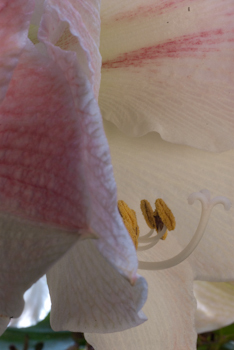 Richard took this close-up of an amaryllis. I love the detail.